KIEV, Ukraine -- Ukrainian President Viktor Yanukovych on Thursday said his cash-strapped country must by January spend at least $3.8 billion dollars on preparations to host its share of the Euro 2012 football championship. 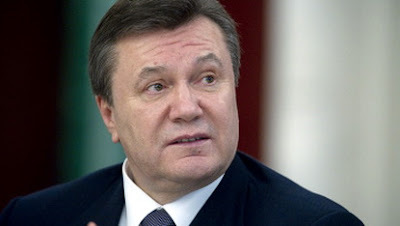 "Currently it (Ukraine's Euro 2012 preparations) are in a horrible state," Yanukovych said at a Kiev press conference. "We have to find people who can do the job." European football organizing body UEFA in April 2007 named Poland and Ukraine co-hosts for the Euro 2012 football tournament. Ukrainian efforts to get ready are far behind schedule, because of funding shortages and in-fighting between government bureaucracies. The worst delays are in the western Ukrainian city Lviv, where work has only begun on a new stadium, and an airport overhaul is stalled because of weak financing. To get back on track Ukraine should spend $5 billion dollars on overhauling transportation, sports, and tourism infrastructure needed to support Euro 2012, but a state budget deficit and banking crisis make finding even a portion of that sum extremely difficult, Yanukovych said. "We have to at the very minimum spend 30 billion hryvnas ($3.8 billion dollars) this year alone," he said. "Otherwise we risk shaming ourselves as hosts who are unable to greet guests in a worthy fashion." Ukraine's government would accelerate spending on Euro 2012 preparations, and "when the time comes, we will be ready," he said. Yanukovych was inaugurated as Ukraine's leader in February. He is a keen football fan and supporter of last year's UEFA Cup winners, Shakhtar Donetsk. UEFA head Michel Platini is scheduled to visit Ukraine next week on an inspection of the country's preparations to host the football championship. Were any of the four Ukrainian cities currently named as game sites for Euro 2012 to fail to get ready in time, the UEFA would likely transfer the games to another city, possibly in Poland, he said in Monday comments in Brussels.